Prius owner Jim Sikes said the accelerator on his car become stuck, taking him on a terrifying high-speed ride. (CNN) -- The California Highway Patrol officer who responded last week to an emergency call about a runaway Toyota Prius described the driver as visibly shaking and said he "appeared to be in shock" once the car came to a stop, according to the police report released Wednesday. The Prius' driver, Jim Sikes, called 911 on March 8 after he said his accelerator became stuck as he tried to pass a slower vehicle. For about 20 minutes, Sikes said, he was unable to gain control of the car as it reached speeds in excess of 90 mph on a winding, hilly portion of Interstate 8 outside of San Diego. He said he repeatedly pressing down on the brakes and trying to lift the gas pedal to no avail. In the police report, responding Officer Todd Neibert said he "could smell the heated brakes which indicated they had been used extensively" and said he saw the brake lights periodically illuminate as he came upon the car. When he pulled alongside the car, "I could see the driver sat up off his seat indicating that he was possibly applying the brake pedal using his body weight." 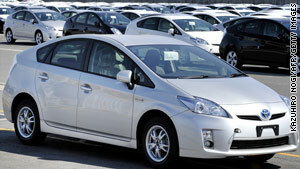 He said the Prius slowed slightly -- down to about 85 mph -- before accelerating again to 95 mph, according to the report. "The driver looked over at me briefly and appeared to be in a panicked state," Neibert's report said. Eventually, Neibert used the patrol car's public address system to instruct Sikes to apply the brakes and the emergency brake at the same time. That tactic worked, and he was able to stop the car. "The driver ... was visibly shaking and breathing deeply," the report said. "He appeared to be in shock." Upon searching the car, Neibert found "a large amount of brake dust and brake pad material in and around the wheels," the report said. Toyota technicians investigating the incident were unable to recreate the same condition, according to a draft congressional memo obtained earlier this week by CNN. In addition, Sikes' claims that he slammed on the brake while his gas pedal was stuck to the floor do "not appear to be feasibly possible," the memo said. David Justo of Toyota Motor Sales headquarters, described in the memo as Toyota's residential hybrid expert, said that if the gas pedal of the car was stuck to the floor, and the driver applied the brake, the engine would shut down. The memo said before Sikes' vehicle could be tested, technicians had to replace rotors, brakes and pads, as the pads and rotors were worn down. Contacted by CNN on Sunday, Sikes said he stands by his story. He declined to comment further.